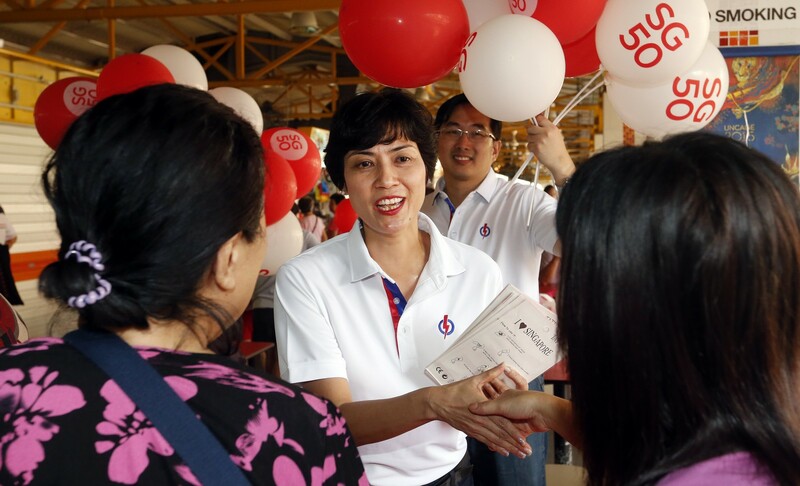 Workers' Party chairmanl Sylvia Lim greeting residents at a party outreach at Chong Pang. 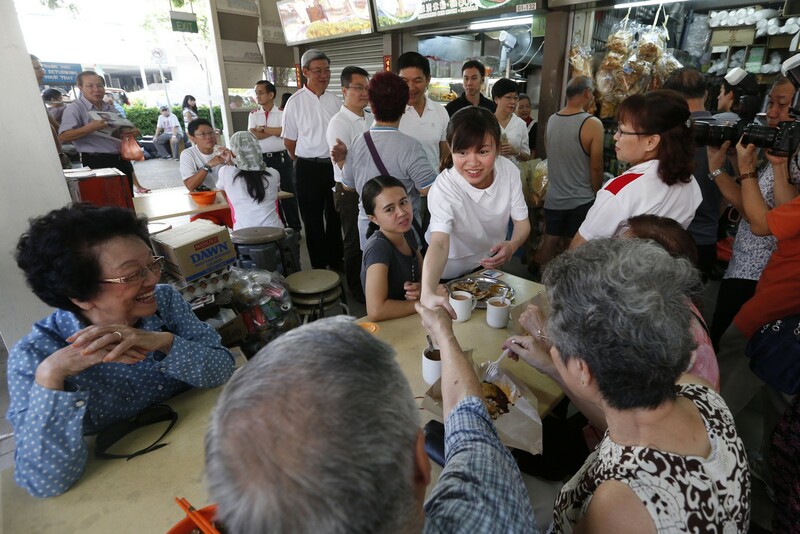 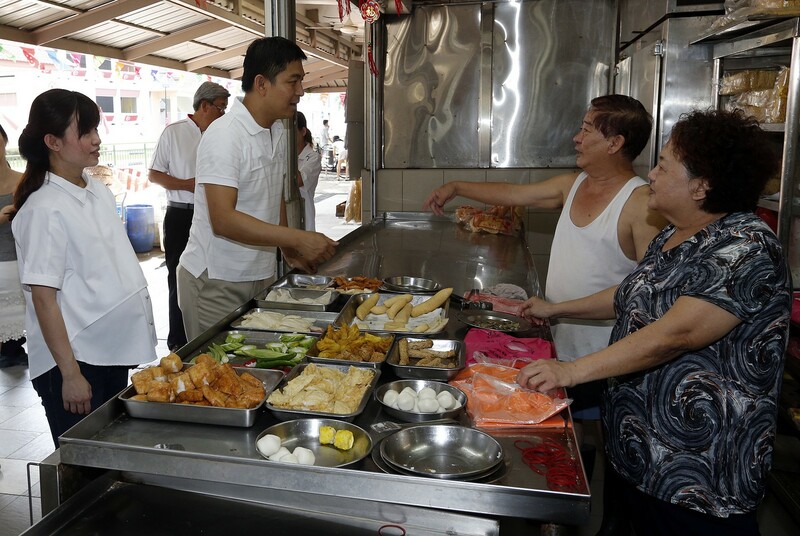 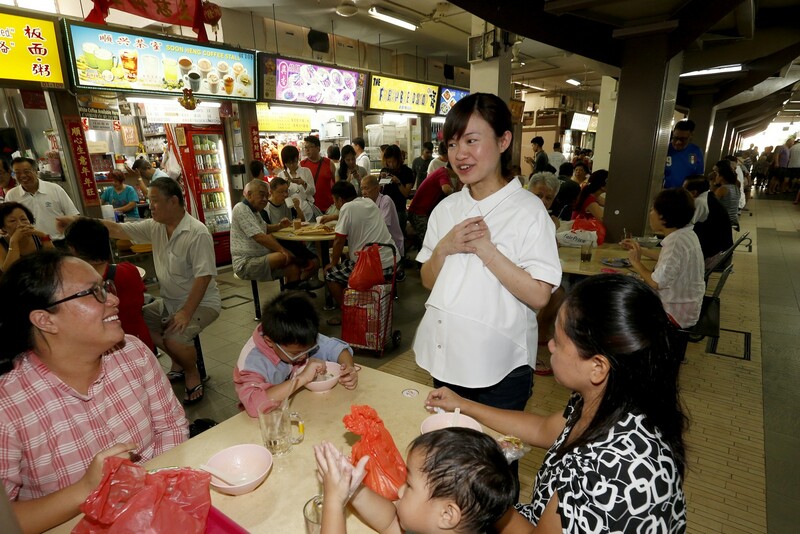 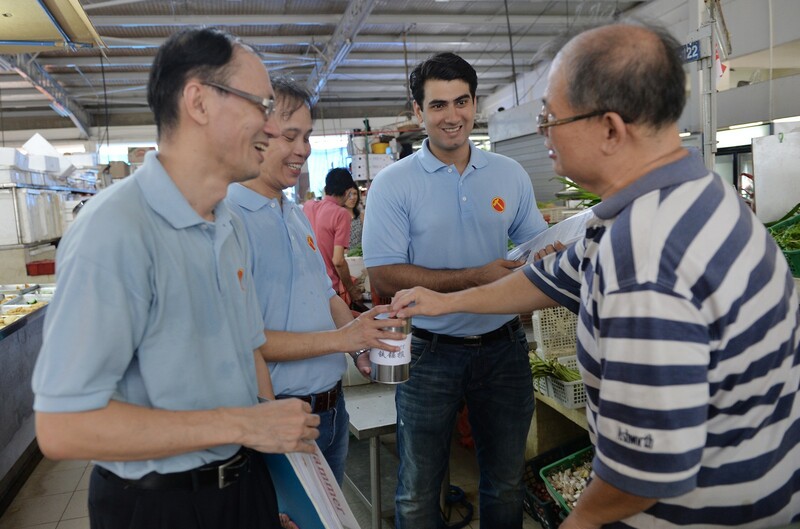 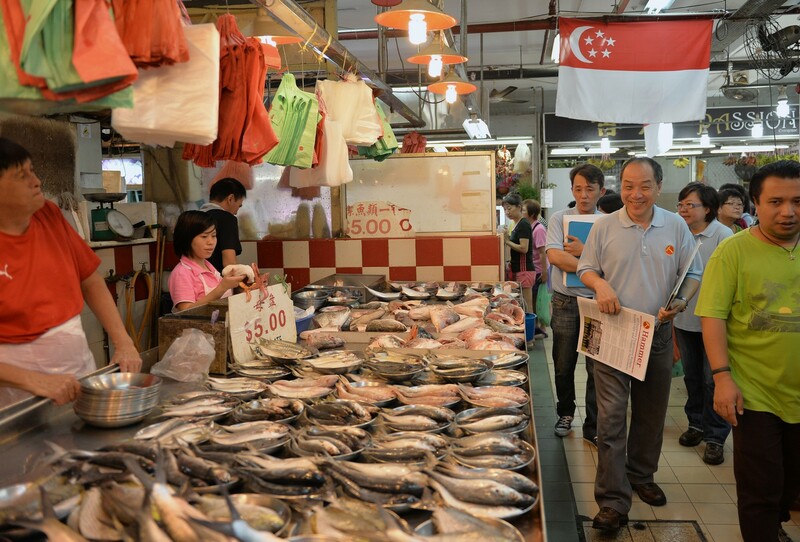 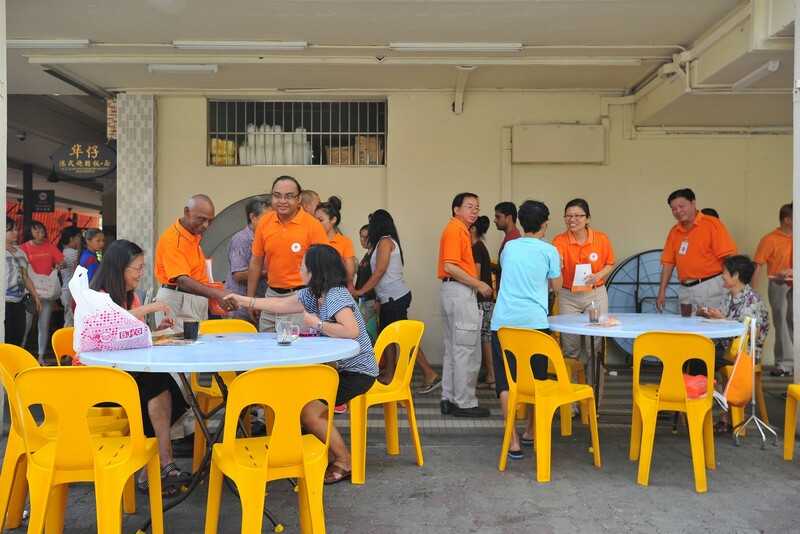 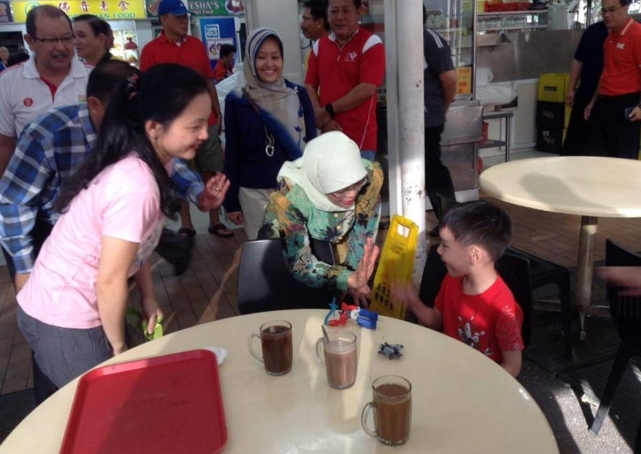 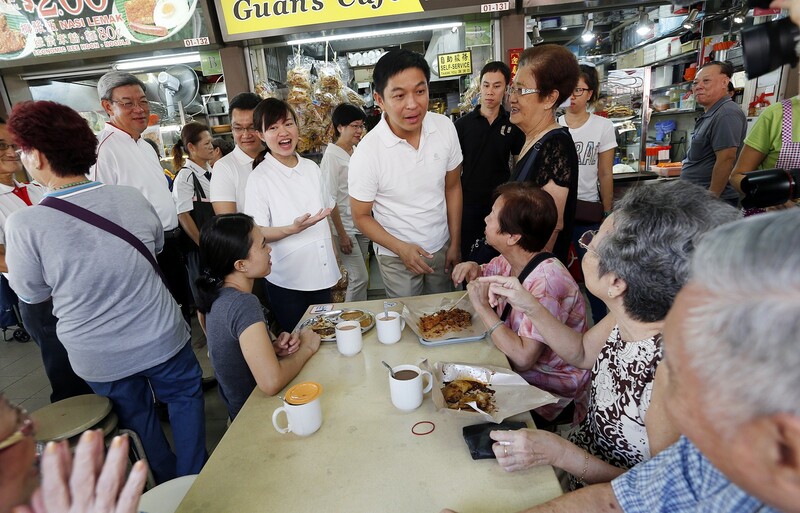 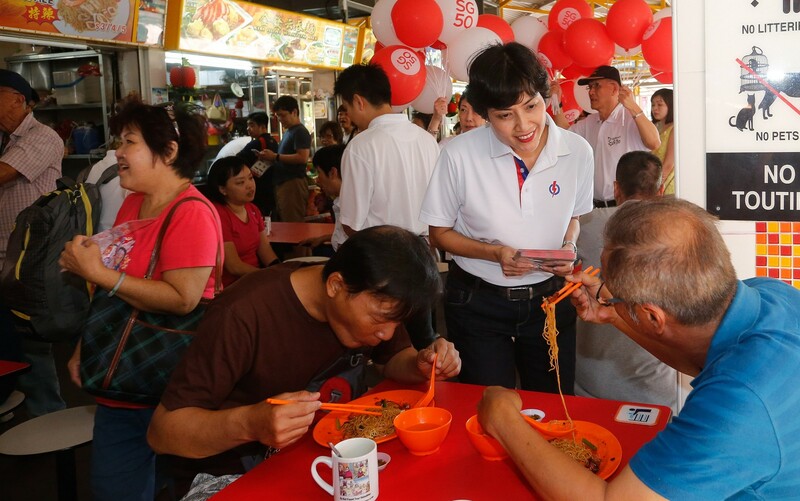 PAP's Dr Lee Bee Wah and Mr Josephus Tan were also at Chong Pang Market and Food Centre to greet residents at the same time as the Workers' Party members. 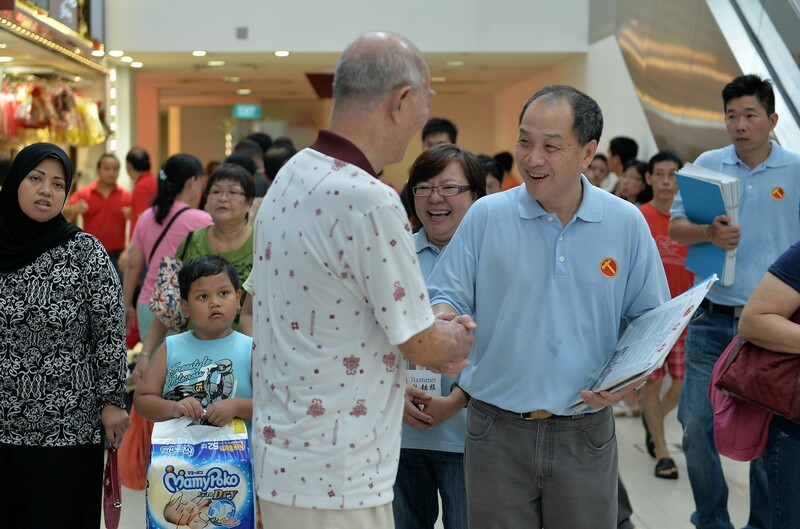 Both camps exchanged cordial greetings as they walked past each other. 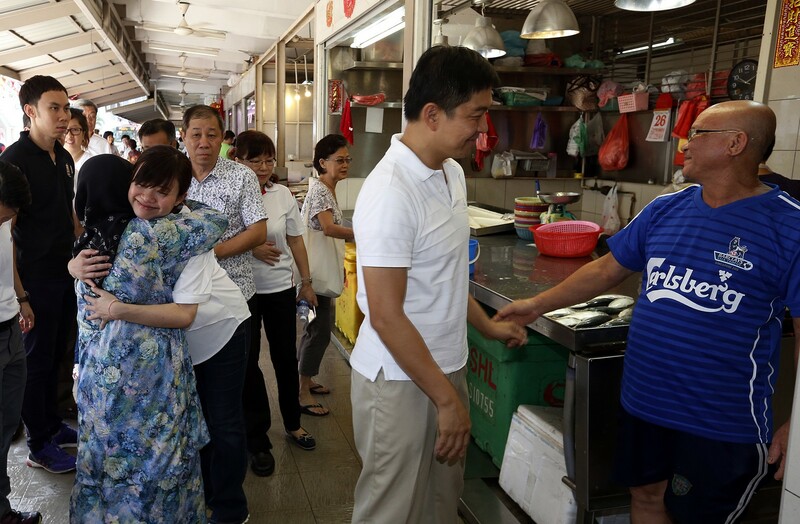 Food stall owner Kelvin Tan, 50, said the crowded food centre was like a political battleground: "Both sides have been very active in coming here many times to meet residents. 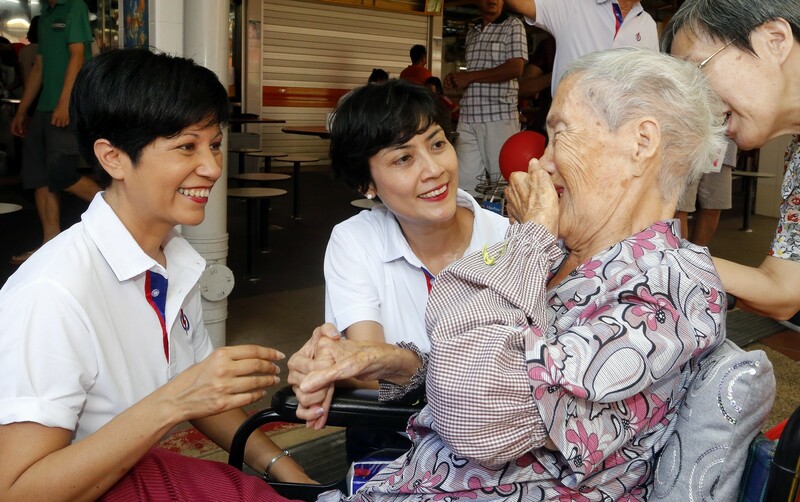 I can't say which side has done more, but personally, it feels very exciting to me." 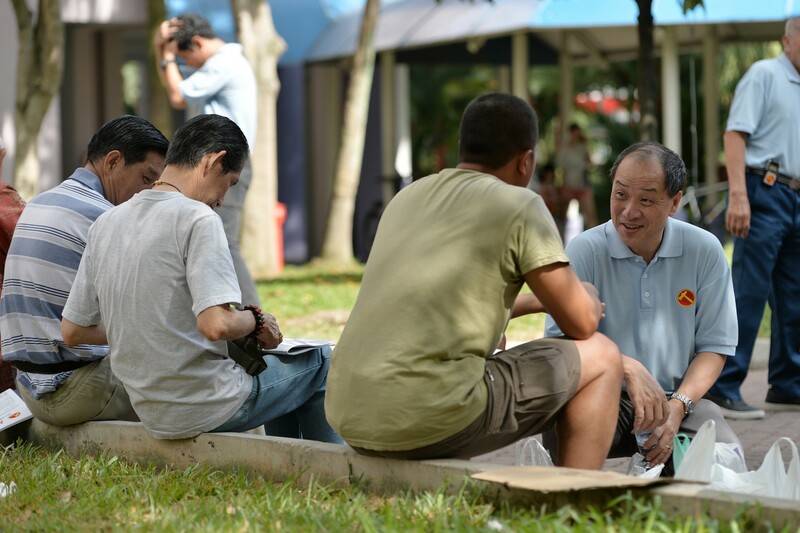 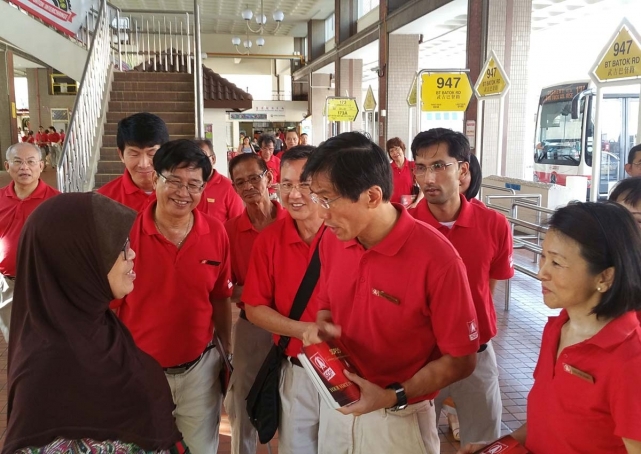 Discussions regarding the Aljunied-Hougang-Punggol East Town Council (AHPETC)'s financial situation will be meaningful only after Aug 31, said Workers' Party's (WP) Member of Parliament for Hougang, Mr Png Eng Huat. 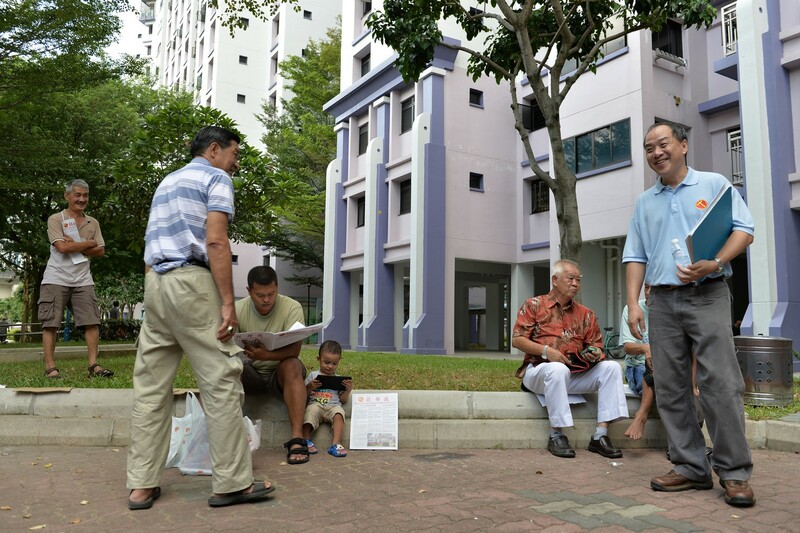 That is the date when town councils will have to close their accounts for financial year (FY) 2014/2015 and submit the audited report to the Ministry of National Development (MND). 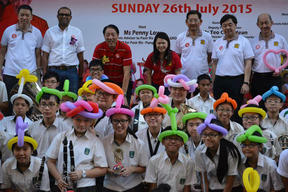 Said Mr Png: "We are trying to close our accounts by Aug 31. 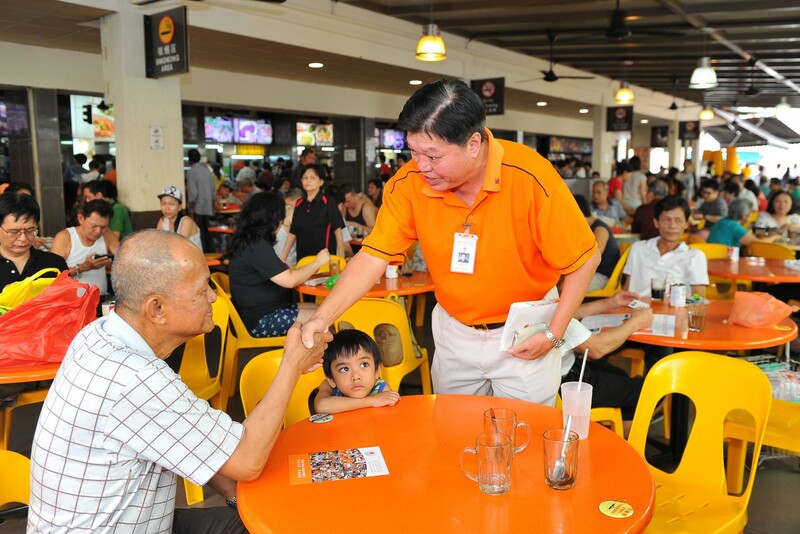 That's across the board and all town councils are working towards that." 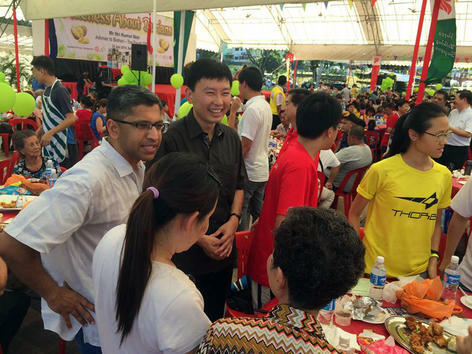 The party had been late in handing up its FY 2013/2014 report, which was due on Aug 31 last year and was submitted on June 30 this year. 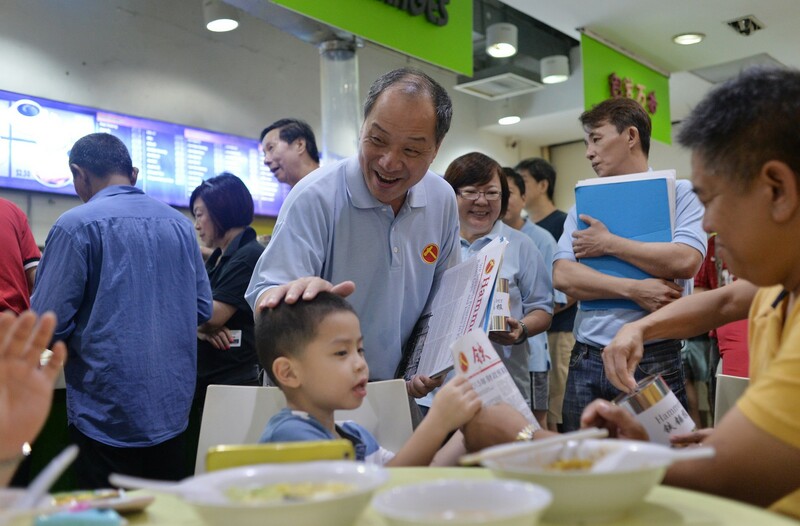 The current Aug 31 deadline was set in February during a parliamentary debate when MND said the state of affairs at AHPETC was "clearly unacceptable". 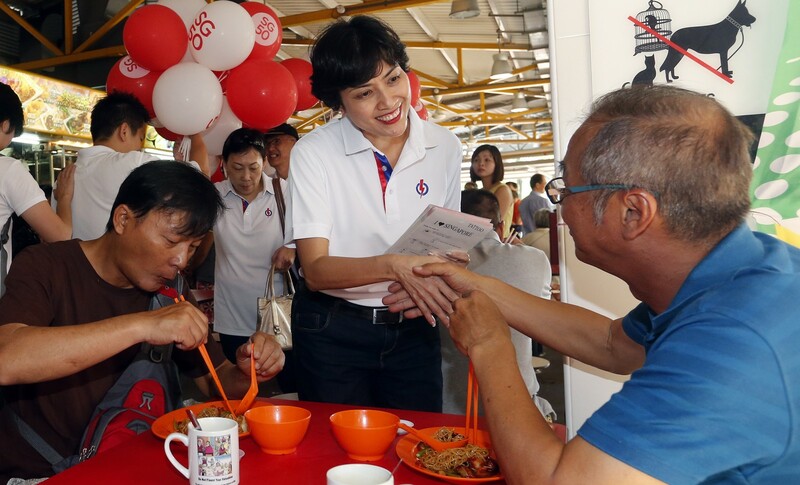 On Friday, Deputy Prime Minister Teo Chee Hean said the first priority for the PAP, if elected, would be to "go in and sort out the mess in the town council''. 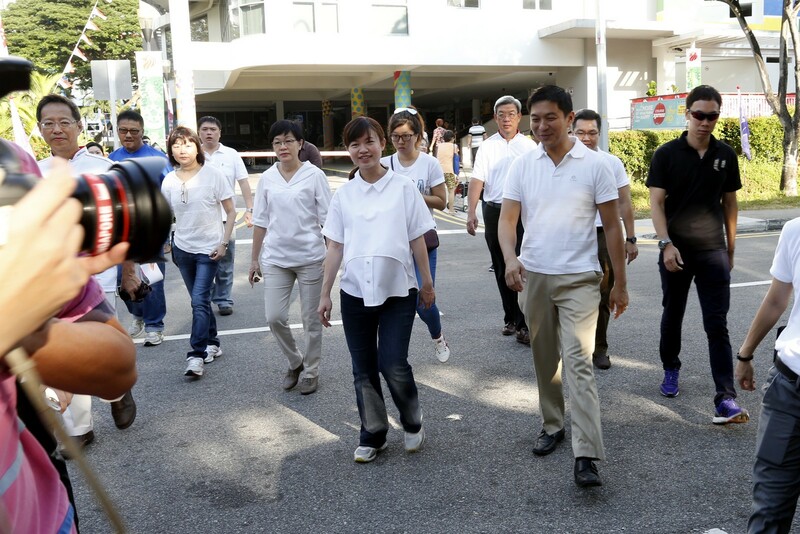 Asked about DPM Teo's remarks, Workers' Party chairman Sylvia Lim said: "I think we leave our residents and the public to judge on the town council front, whether we have shortchanged our residents, be it in estate cleanliness, maintenance, lift breakdowns and so on." 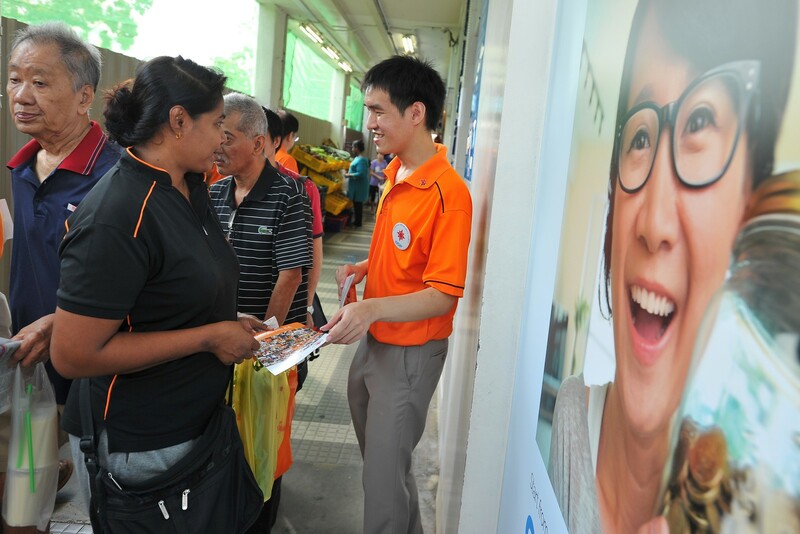 National University of Singapore sociologist Tan Ern Ser believes that the AHPETC is the WP's Achilles' heel: "If releasing the records on Aug 31 enables them to come free of those negative assessments, the WP could get back to their First World Parliament campaign concept and avoid being labelled as a party that runs a Third World town council." 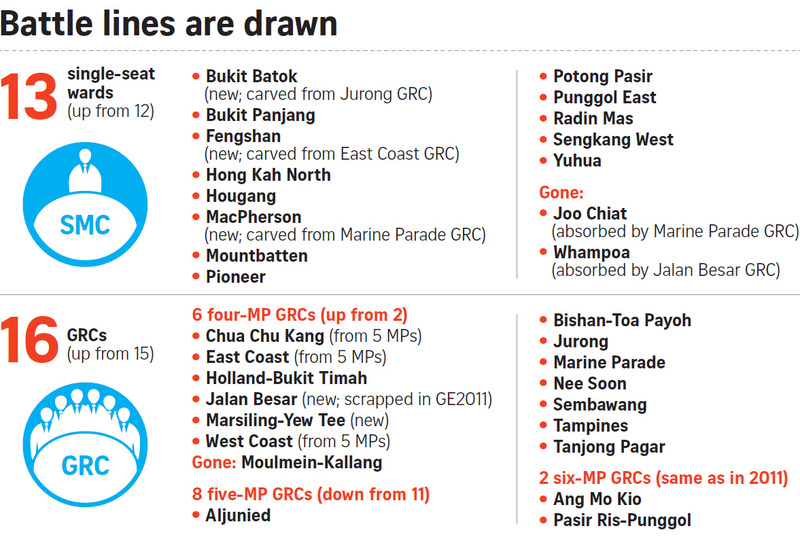 So far, the WP has not announced any new candidates aside from the currently elected MPs. 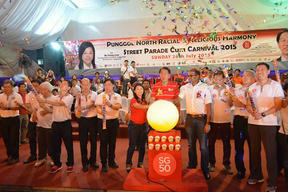 Ms Lim said the party will probably announce its candidates "some time" after the National Day Rally on Aug 23. 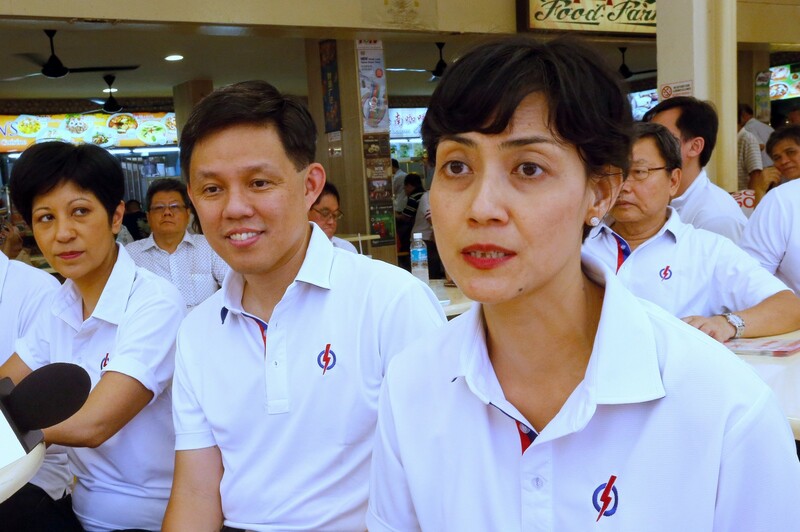 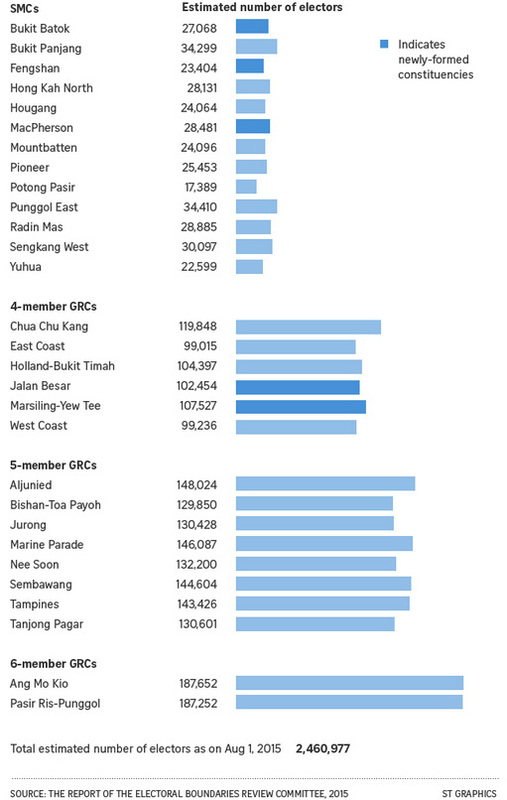 All of WP's MPs will not budge from their current constituencies, revealed Ms Lim. 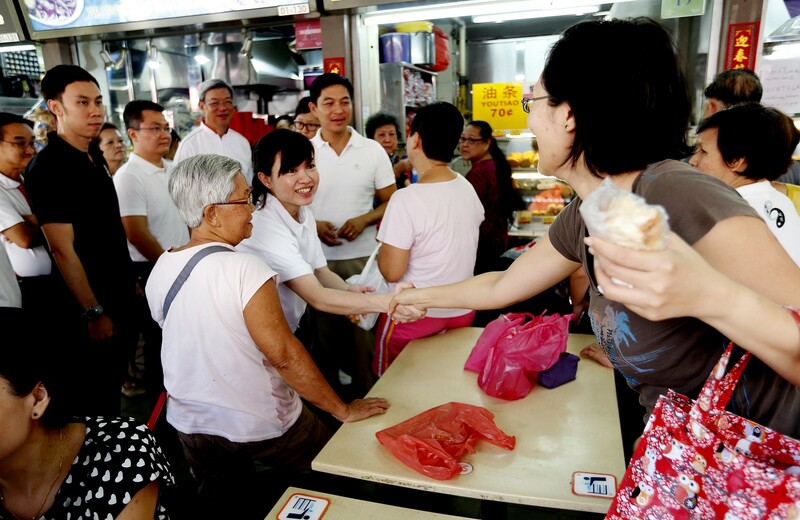 When asked, she did not elaborate on the party's plans for Fengshan. 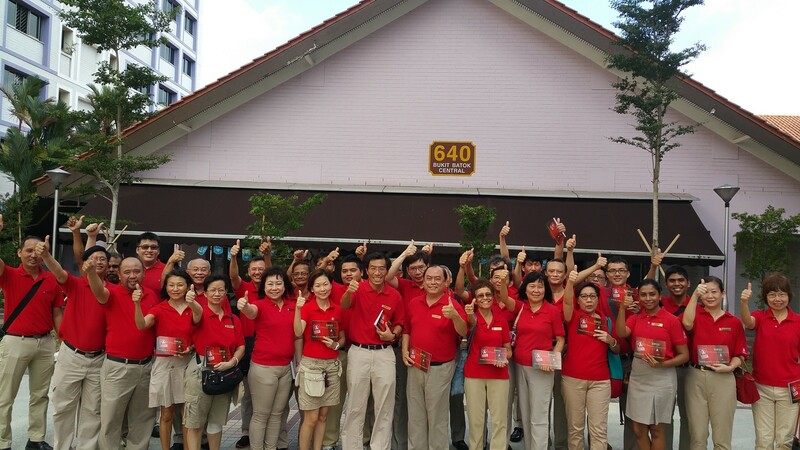 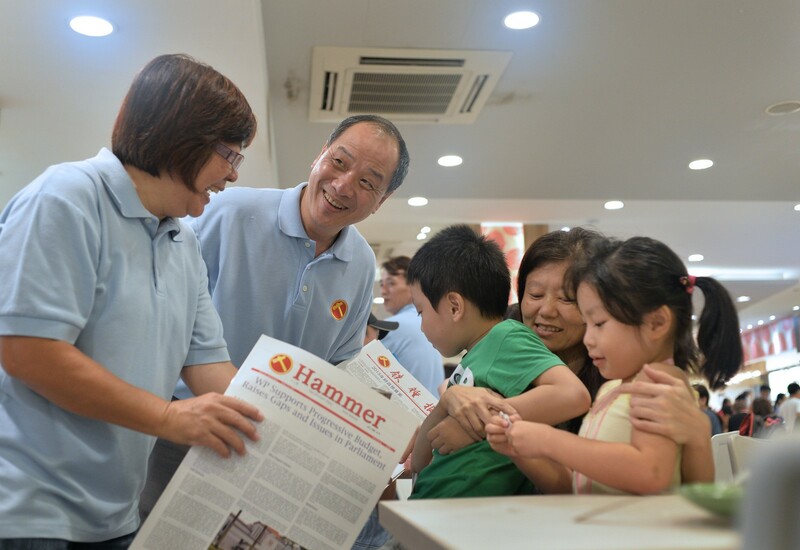 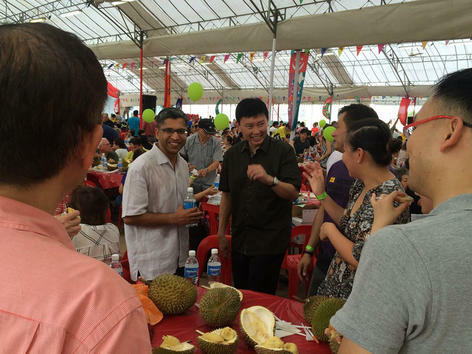 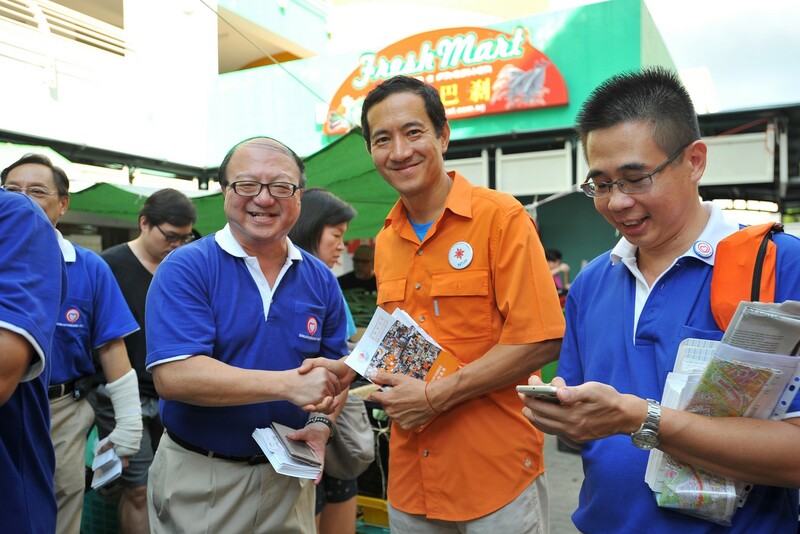 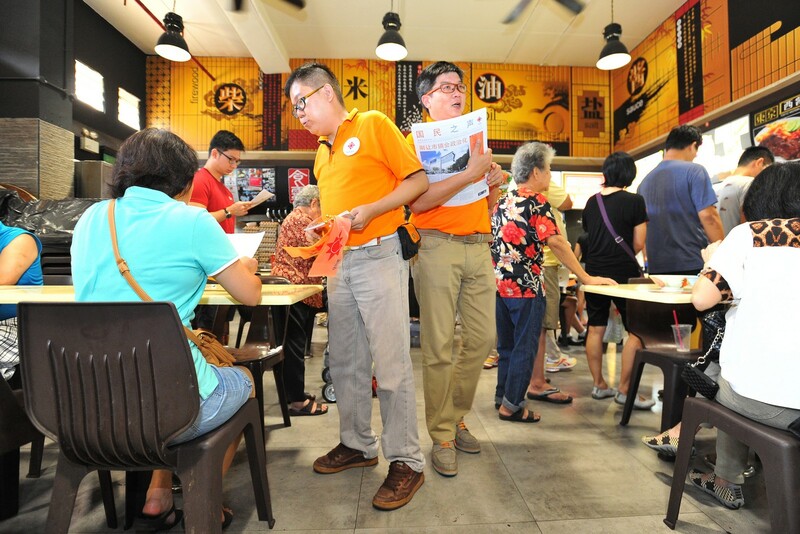 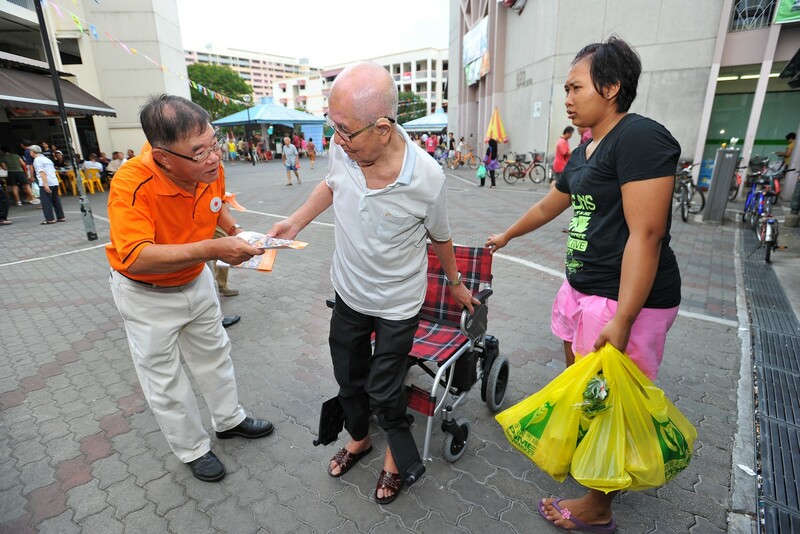 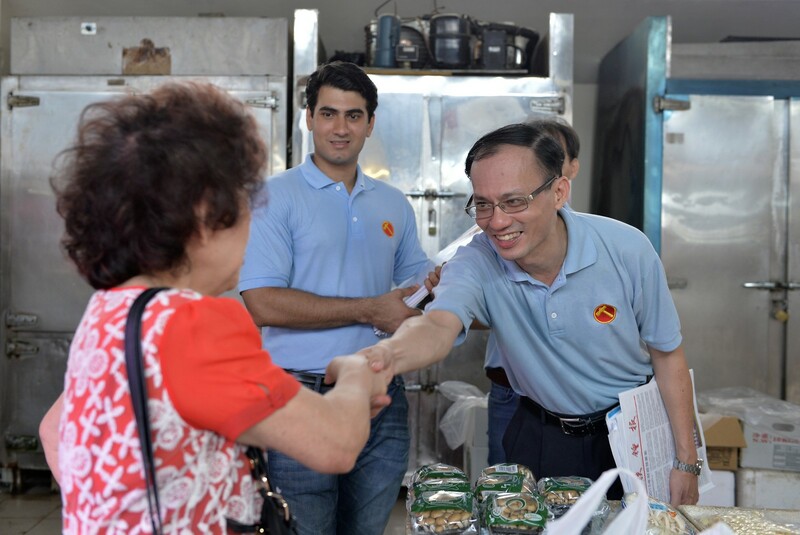 While the party has always been traditionally tight-lipped about its potential candidates until Nomination Day, several familiar faces were spotted making their rounds around Chong Pang Market and Food Centre to sell the party's newsletter, the Hammer. 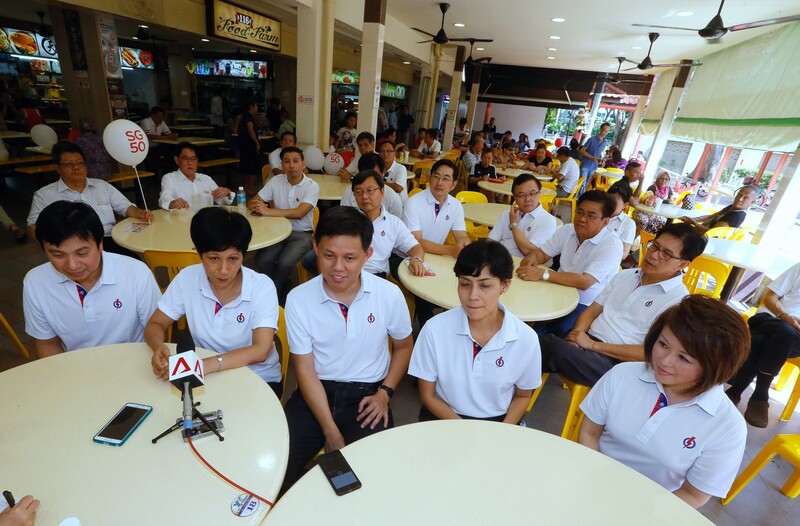 Potential candidates like consultancy firm chief executive Leon Perera, 44, sales consultant Cheryl Denise Loh, 32, and company chief executive Luke Koh, 40, were present.